This data set provides diameter at breast height (DBH) measurements for 1,063 trees located at the Catuaba Experimental Farm, and 812 trees located in the Humaita Forest Reserve. Both sites are in the state of Acre, southwest Amazonia, Brazil. Measurements were made on individuals with DBH between 10 and 35 cm and individuals with DBH > 35 cm. The Catuaba Experimental Farm is part of a forest fragment of approximately 800 ha. The Humaita Forest Reserve is located in a 1,500-ha forest band with dominant bamboo characteristic. Ten-ha areas were inventoried at both sites. There is one data file in comma-delimited (.csv) format with this data set. There is also one companion data file with supplemental Catuaba site tree height and biomass data. This data set was archived in August 2014. Users who download the data between August 2014 and September 2019 must comply with the LBA Data and Publication Policy. There is one comma-delimited data file (.csv) with this data set. Measurements were made twice at the Catuaba site between November 1999 and July 2002, and one time at the Humaita site between January 2003 and April 2004. Note: There is also a companion file in comma-delimited format (.csv) provided with this data set, LC02_Catauba_biomass_height.csv. The file provides DBH, height, and calculated biomass estimates for most of the trees at the Catuaba site. For most of the tree records (Tree_tag), the values for X, Y, DBH, and Common_name are identical to X, Y, DBH_first_inv, and Common_name values in the data file LC02_Catuaba_Humaita_10ha_inventories.csv. However, there are some differences and these differences could not be resolved. Consequently, we are providing the tree height and biomass data in the companion file and leaving it up to users to compare and selected tree height and biomass data as needed. Temporal Resolution: At the Catauba site, two surveys-- the first between Nov. 1999 and July 2000 and the second between Sept. 2001 and Sept. 2002. There was one survey at the Humaita site between January 2003 and April 2004. Living trees constitute a major carbon pool in tropical forests (Vieira et al., 2004). A better understanding of the variations in structure and dynamics of these forests is necessary to better predict the ability of these systems to respond to disturbance and their potential to act as either a sink or a source of carbon in the future. In combination with similar data from other sites across the Amazon basin, these data contribute to a better understanding of the role of seasonality, disturbance and diversity in regulating carbon allocation and productivity. Diameter measurements were done with steel tapes with an error or plus or minus 0.2 cm. Data have been reviewed and there are no known problems with them. The Catuaba Experimental Farm is a Federal University of Acre property in the east of Acre State. The farm is part of a forest fragment which covers approximately 1,500 ha with open forest mixed with bamboo the dominant forest type. Soils are Oxisols at the permanent plots (latossolo vermelho amarelo distrofico in the Brazilian classification system) (Vieira et al., 2004). The Humaita Forest Reserve is located in a 1,500 ha forest band with dominant bamboo characteristic. Ten ha (200 x 500 meters) permanent study plots were established by the Sector for Studies of Land Use Change, Federal University of Acre (SETEM-UFAC) in 1999. All stems greater than 35-cm diameter DBH (DBH measured at 1.3 m above the ground unless otherwise noted) were tagged, mapped, and measured. 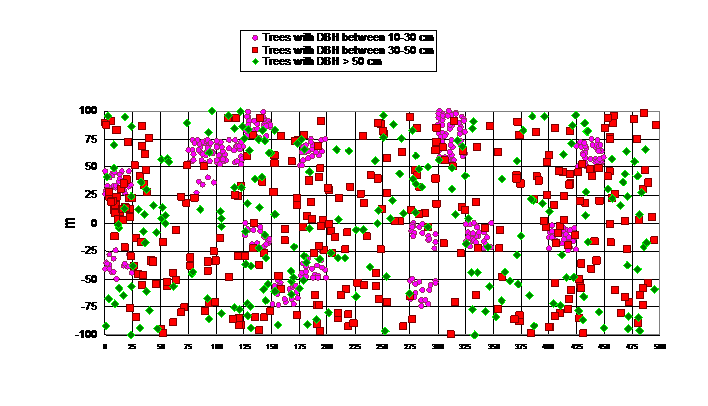 Trees with DBH between 10 and 35 cm were measured, mapped, and tagged in 16 sub-plots (25 x 25-m area for a total sampling area of 1 ha) (Vieira et al., 2004). Figure 1. Locations of trees at the Catuaba site on the X-Y grid. Y values can be negative. where: α= −0.370; β1=0.333; β2=0.933; and β3=−0.122.